Global warming and an increased desire to clean the environment has spurred many new environmental regulations and policies, and support to invest in renewable energy sources. Building a strategic plan that incorporates an understanding of new energy policies and regulations, fluctuating pricing and long-term emissions allowance forecasting requires guidance from experts and innovative technology. Prestiva possesses the technological capability and industry expertise to assist utilities in adapting to new environmental regulations. Prestiva Consulting Group is at the forefront of the environmental changes affecting the energy industry, developing strategy, forecasting, assessing regulations and preparing organizations for the changing atmosphere. Expert teams assist clients in defining environmental policies, developing a strategy and implementing those policies. Prestiva can help clients develop a plan to find optimal market-driven and environmental compliance options for multi-pollutant compliance requirements and production costs. Prestiva is experienced in articulating how sustainability and corporate responsibility provide benefit, outlining the risks and opportunities of environmental policy compliance and developing a profitable compliance plan. We will assist in developing appropriate strategies and a business case for change. Prestiva has developed fundamental and market-based analytic techniques to forecast the long-term value of emission allowances and Renewable Energy Credits throughout the globe. Our independent forecast is designed to assist developers, investors, and utilities in the development, procurement and pricing of renewable resources and electricity. Prestiva guides organizations in choosing the optimal compliance strategy to manage energy use by evaluating varied capital requirements, operating cost, effectiveness and potential operating restrictions. Prestiva assists in deciding which compliance option best fits your company and outlines the associated implementation strategy. Prestiva can help implement a strategy for adopting renewable energy practices in a cost effective approach utilizing advanced technology and expert analysis. 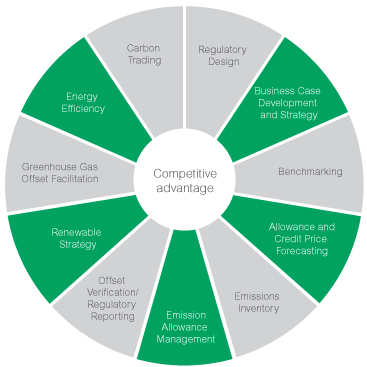 This includes defining the market-driven environmental compliance options, requirements and production costs and implementing a plan that benefits your company by providing a projection on the value of energy, capacity, renewable energy credits, gross margins, value of generator facilities, and devise market models. By evaluating these projections, Prestiva can determine an approach to employ renewable energy within your company. Prestiva assists clients by providing services including: process evaluation of the effectiveness of program design, research relating to market barriers and market characterizations, on-going tracking of market indicators, technology assessments, sales tracking and efficient market share studies, baseline studies of energy efficiency related to attitudes behaviors and equipment, and analyses of market forces and key actions for capturing efficiency benefits using market-based incentives.